There are two main types of 3D printer filament that are widely spread and used by Fused deposition modeling (FDM) based 3D printers such as the MakerBot Replicator series for example – these are ABS and PLA, though there are various other alternatives also available. Both ABS and PLA are thermoplastic materials that start to melt when they are heated up, so that they can be used to form another object and solidify when they cool down. ABS (Acrylonitrile butadiene styrene) is a common thermoplastic often used in 3D printing, but it also has many more applications. 3D printing using ABS has some additional requirements from the printer such as a heated bed, so not all devices are capable of supporting ABS printing. The objects printed from ABS are generally harder and more durable, can be used with higher temperature before starting to soften (about 100 degrees Celsius or more), but are also harder to print and generally provide less detail to the printed parts. If printing with ABS you must be careful and have good ventilation as the fumes produced when ABS is melted for printing are not totally safe. PLA (Polylactide) is a biodegradable thermoplastic aliphatic polyester derived from renewable resources, such as corn starch for example. PLA is probably the most widely used material for 3D printing as it is easy to handle and offers very good detail level. The only drawback that it has is the relatively low temperature that the material starts to soften – above about 65 degrees Celsius. It does not require the printer to have a heated bed like ABS for example, so it is more 3D printer friendly, especially to the lower cost models. In general both ABS and PLA have their advantages and disadvantages compared to each other, so you should choose the material based on what you are planning to be using the 3D printed parts for. If you need to print in ABS you should be careful when choosing a 3D printer supporting ABS prints as not all do and it such cases it is better to go for a model that has support for both ABS and PLA. If you are new to 3D printing and are getting your first 3D printer to play with it at home, then it is better to go for a model supporting PLA as you probably will not need ABS printing capabilities. Both ABS and PLA filaments come in the form of thin round lines with specific diameter (1.75mm or 3mm are the most common) that are wrapped around a spool. 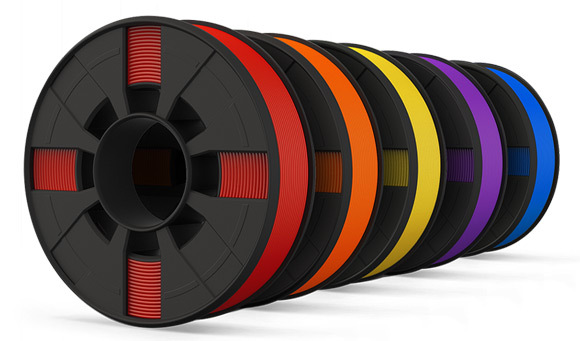 The 3D printer filament is being sold in spools with the material calculated and priced based on its weight and not length of the line for example, there are already many available colors for both materials that you can find available from various manufacturers. There are of course many other materials that can be used for 3D printing, though they are mostly experimental and you should be prepared to have some issues and tinker with your 3D printer’s settings should you decide to try them out. There are multiple alternatives for a flexible rubber type of filament available for 3D printers that will allow you to print rubber like flexible models on your device. You can also find filaments that contain carbon, wood and even small stone particles that when printed will create an effect making it like if the 3D printed object is made from carbon, wood or stone or at least looking a lot like that. There are also other kinds of interesting 3D filaments available, but again most of these are experimental and using them can cause some problems on your 3D printer such as jamming of the print head etc., so be careful when you decide to try these out.